PR-Nigeria.com, a private owned contract agency recently published what can best be termed as a scandalous hack-job in a last ditch, desperate effort to defend the person of Army Chief Yusuf Buratai in the public scandal of his alleged purchase of $1.5 million worth of properties in Dubai between 2014 and 2015. At the peak of the Dasuki Arms-gate money for Boko Haram war diversion era. It was a devious attempt by PR-Nigeria to clear their employers. The press release did not fail to declare that "PR-Nigeria was a consultant for the security sector." In essence, the "ad" was paid for by Buratai. We proceed to illustrate how PR-Nigeria did not only confirm that Army Chief Tukur Yusuf Buratai has no defence as yet for his millions of dollars property and investments in Dubai and Nigeria but also sadly the publicity company registered to or reminded Nigerians that PR-Nigeria itself is a disreputable for-hire propaganda organization. In "clearing Buratai," PR-Nigeria "said investigation has shown that the Dubai investments were based on capital market principles of shareholding." At this point, PR-Nigeria made first reference to "shareholding." We will discuss this duly. The release went on to say: "While quoting unnamed government sources, PR-Nigeria said the capital market principle that governed the properties in issue, as it was found by investigators, was like having shares in companies instead of wholly owning the properties." PR-Nigeria in the first line of this paragraph made reference to "unnamed" so-called government sources as having run the rapid lightening-speed investigation of Buratai. This was evidently another demonstrable part of the scam relying on the goodwill and "dependence" of the embarrassed-Presidency on Buratai and its possible hopes that Buratai and agencies that work for him could make the scandal go away. We affirm as is rather obvious that this so-called investigation is absolutely false. 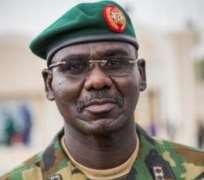 No agent or agency within the Buhari government investigated the allegations of corruption against the person of Army Chief Yusuf Buratai since they were serially exposed by SaharaReporters a few days ago. "The government, after investigating a recent media report over the acquisition of property in Dubai, United Arab Emirates (UAE) by General Buratai, discovered that he and his wives invested as "shareholders" like many other persons in the property mentioned in the publications and were not the sole owners. It is immediately clear that by purposeful serpentine, meaningless editorial work, PR-Nigeria was attempting to fraudulently discombobulate Nigerians on the simple facts. What was the value of these several sentences referring to the properties as shareholder purchases and investments? What does this aslant information have to do with the amount Buratai invested in Dubai? Which Nigerian is interested in knowing whether Buratai bought one house, one piece of a house, a condo, a hotel room or shares in a hotel company or even desert sand in Dubai with the $1.5 million? The total figure invested or with which Buratai bought shares in the Dubai properties firm is $1.5 million. Is this not correct? Does this not remain correct regardless of whether Buratai bought and owned two detached properties or if he bought condos or shares in hotels with stated total sum? The issue at stake here is the fact that funds running into millions of dollars were allegedly traced to Gen. Buratai in the Dasuki 2014 year of military looting, with unscrupulous and highly suspicious bank transactions linked to the General, and some of these funds were invested in Dubai. Whether the General used those funds to purchase a mansion or to rent an apartment is irrelevant. We expect the General to explain the source of those funds, the reasons for the shady transactions and to clarify that the said funds do not represent proceeds of corruption, most particularly and painfully diverted from Nigeria's capital meant for the war against Boko Haram. What Nigerians need to see is a full and open investigation by the relevant arms of of government: EFCC, ICPC, special Military tribunal and/or court martial and any and all other relevant military and civil authorities. Nigerians need to see that official agencies of government including the spokesperson of the Army are no longer unconstitutionally chartered to defend the personal matters of the Army chief. It is Buratai's duty and his alone to state his defence. Nigerians will like an exigent, clearly defined response from the Presidency on this matter of far reaching national security implications as well as the holding of all corrupted and fraudulent service men and agencies to immediate and proper account.